For the annual friendly game hosted by Manchester City, see Super Match (association football). The Super Match (Korean: 슈퍼매치) is a name for a rivalry between two South Korean football teams from the Seoul Capital Area, FC Seoul and Suwon Samsung Bluewings. The match and the rivalry between the two teams is regarded as the biggest in South Korean K League. The first match was played in 1996. The rivalry became more fierce in 2004, after Anyang LG Cheetahs returned to Seoul and changed the club's name to FC Seoul. 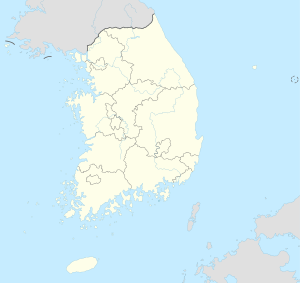 In 1996, due to the decentralization policy in K League, LG Cheetahs (currently FC Seoul) was compulsorily relocated from Seoul to Anyang, which is a satellite city of Seoul and located approximately 21 km south of Seoul. The Suwon Samsung Bluewings have joined the K League at the same time in 1996. Seoul did not have any football club at that time. Therefore, both clubs have been getting spotlight by football fans at Seoul National Capital Area. Moreover, LG Electronics and Samsung Electronics were rival in the electronics industry. Naturally, rivalry began between two clubs. The Jijidae Derby was named after the hill on the South Korea National Route 1 which connects the two cities, Suwon and Anyang. Jijidae derby was last played in 2004, when Anyang LG Cheetahs has returned to Seoul and changed the club's name to FC Seoul. Since then, the match between FC Seoul and Suwon Samsung Bluewings has been known as the Korean Super Match. As of 15 August 2018. K League official match statistics are including Anyang LG Cheeths statistics. All records and statistics are based on K League official FC Seoul vs Suwon Samsung Bluewings all-time statistics. Penalty shoot-outs results are counted as a drawn match. ^ "Former neighbours, forever foes". FIFA.com. 30 July 2009. Retrieved 30 April 2016. ^ "'축구와 전쟁 사이' 서울 vs 수원 더비" (in Korean). KBS NEWS. July 8, 2012. ^ "K League official FC Seoul vs Suwon Samsung Bluewings Statistics" (in Korean). K League official website. September 30, 2011. ^ "K League official FC Seoul vs Suwon Samsung Bluewings All-time Statistics" (in Korean). K League official website. August 15, 2012. This page was last edited on 20 February 2019, at 08:56 (UTC).